I know it's been forever but I really felt this was worth sucking it up and sitting down to blog for!! My hubby is from Oklahoma so this tragedy hit close to home. Some of his family was in the middle school right next door to the elementary school where so much damage was done. By the grace of God, they all made it through safely! I really want to do whatever I can to help so I am going to donate 100% of whatever I make over the holiday weekend to this cause. The teachers involved were so brave! Please go to my store and see if there is anything there you might like to have, everything will be 10% off until Tuesday. 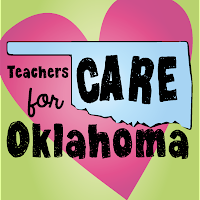 The more we sell, the more help Oklahoma will get! Check out the Blog Hop to see who else is involved and help out while getting some awesome new resources! Happy Memorial Day Weekend! Thanks so much to all the Armed Forces who have given so much for our country!